Chung Eui-Yong (2nd R), head of the presidential National Security Office, and Suh Hoon (L), the chief of the South's National Intelligence Service, talk before boarding an aircraft as they leave for Pyongyang. (CNN) - Top South Korean negotiators left for the United States Thursday to brief their American counterparts on the outcome of their historic meeting with North Korean leader Kim Jong Un earlier this week. 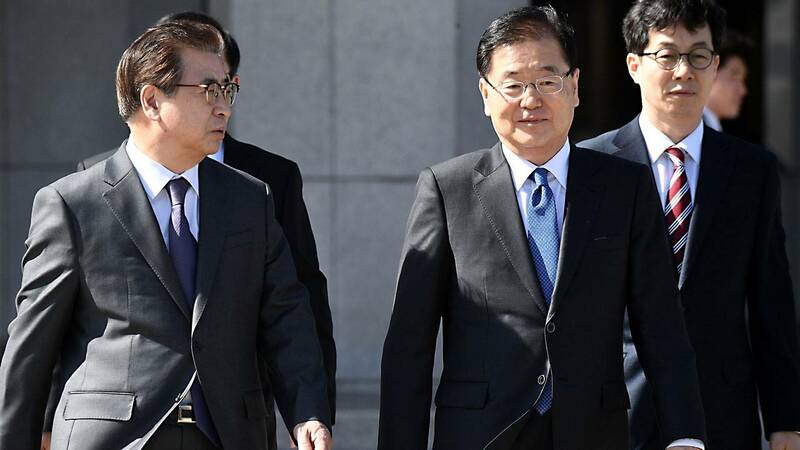 South Korean National Security Office Head Chung Eui-yong revealed few details of the trip as he boarded a plane at Seoul's Incheon Airport for a brief two-day visit to Washington. "The most urgent issue is to make sure the United States and North Korea will engage in talks," Chung said, as he departed with National Intelligence Service chief Suh Hoon. A White House official told CNN that Chung will meet US national security adviser Lt. Gen. H.R. McMaster at the White House Thursday afternoon. Afterward, the South Korean delegation is expected to brief other senior officials from the US government. Secretary of State Rex Tillerson is out of the country on his first official trip to sub-Saharan Africa. The two diplomats recently returned to South Korea from an unprecedented meeting with North Korea's Kim in Pyongyang, believed to be the leader's first face-to-face talks with South Korean officials since he took power in 2011. "I think that their statement and the statements coming out of South Korea and North Korea have been very positive," US President Donald Trump said Tuesday. "I think that they are sincere. ... I hope they're sincere. We're going to soon find out." Robert Kelly, associate professor of political science at Pusan National University, told CNN the level of enthusiasm for talks in the United States could depend on how the South Korean government sells them to the US president. "We're a year and a half into US President Trump's administration and it's pretty clear Trump wants the publicity and the wins," he said. "If the South Korea and North Korea deal can be marketed to him in those terms, I think he'll be on board." If any North Korean talks with the United States do take place, there's a possibility they could be handled by an outside expert, an administration official told CNN Wednesday, due to the depleted nature of the US State Department. US Secretary of Defense Mattis has said he was "cautiously optimistic" about the offer of talks from North Korea. However he noted there had been "optimism before" about negotiations which had ultimately failed. "We're going to have to watch actions and see if they match words," he told reporters Wednesday during a visit by the Estonian Minister of Defense to the Pentagon. Kelly said it would take "real" concessions from the North Koreans, involving human rights or their nuclear program, to make him believe they were serious. "Then Moon can take that to the Americans and the conservatives back in the South, that's what I'm waiting for," he said. "The rest is process, what matters is that there are substantial concessions." Every year when the drills are held it provokes a strong response from the North Korean government, including military displays of force. According to South Korea, Kim told Tuesday's delegation he "understands" the inability to delay them.